The former player is still very close and linked to the supporters clubs. 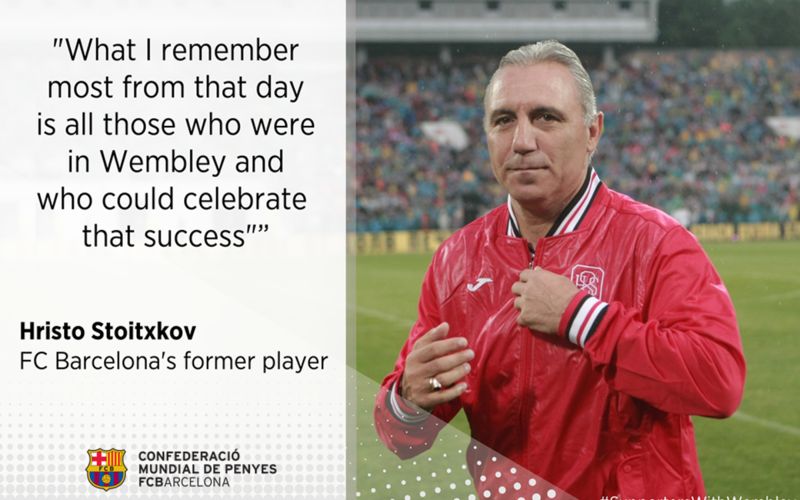 25 years after the First European Cup, we ask him about the role of the supporters clubs within the Barcelona supporters and about that magical night at Wembley, that marked a milestone for FC Barcelona. How would you define the task of the FC Barcelona Supporters Clubs? Their task is essential. Supporters Clubs bring together many people who love Barça which organize a series of increasingly better activities. They live the blaugrana (blue and red) colors very intensely and are happy to dedicate their time to Barça. Were you aware of the existence of the Supporters Clubs when you were an active player? Of course, I experienced support of Supporters Clubs in my time as a player, and I still notice it today. Thanks to the penyistes (Supporters Clubs members) and the fans, we also grow as football players. When you feel the chang your name and notice the support for the team, you realize you have the obligation to strive to the maximum, also for them. They are a part of the trophies won, both at individual and team levels. The Peña Barcelonista de Málaga appointed me honorary president, which feels me with great pride. They are very kind and friendly people whom I consider my friends, who always treat me with much affection. A few months ago I went there with them and everyone showed me their affection, showing me old photos and reminiscing experiences and certain moments in the history of Barça. Have you had any other direct relations with the Barça Supporters Clubs movement? I have had contact with different Supporters Clubs and I have been present in some of their activities. I feel a lot of respect and affection for all, because they all play a very important role wherever they are. The penyistes have an intense bond with Barça. I know people who suffer and cry when things have not gone well, but they do not stop supporting. They are humble people who always want to see and share the emotions given by Barça. From the outside, how do you see the role of the clubs established abroad? It is not easy to establish Supporters Clubs outside Catalonia or Spain and to be able to keep their activity. There is one here in Miami, where we meet sometimes to watch some matches or comment on football news. There is no doubt that Barça has a great international echo, with many fans around the world, and the Supporters Clubs help to love this club. Is it more difficult now to maintain the players' contact with the fans? It is very difficult for current players. We former players have more free time, therefore it is easier for us to attend events with fans or penyistes, but the truth is that there should be some situations in which players could get closer to people. It would be a way to give back some of the affection and support they give us. 25 years after the Wembley 92 final, what memories do you have? As a player who lived that final on the pitch, being able to raise a European Cup is a very beautiful and important event. It was a moment full of excitement, but what I remember most from that day is all those who were in Wembley and who could celebrate that success. Twenty or twenty-five thousand followers who traveled for many hours to be at Wembley that May 20. I cannot forget the happiness of these people, who after suffering so much during the trip and the match, at the end could shout: "Champions, champions." How do you value the Barça Legends project and its participation? Every little helps, and every presence of the Barça is always positive to spread the barcelonisme – the Barça spirit - worldwide. Personally, I always like to wear the blaugrana tricot. I played with the team of former players Barça Legends in Mexico and I had a great time enjoying football with old friends and colleagues.